This is a picture of what became known as “The Morris Murder House.” At my class reunion this week, we talked about it because for high school kids in the sixties, it was literally and figuratively a “favorite haunt.” You see, as legend goes, the Morris family (and I always thought it was Morse family) was well-to-do and lived in the nicest house in the Decatur, Michigan area. In 1879, the family, all but the maid, were savagely murdered. 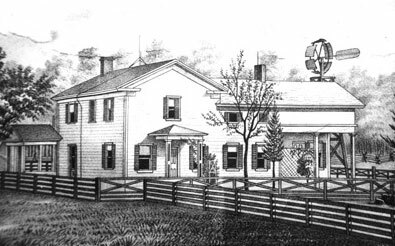 Though there was much speculation the murderer was the maid or a robber who stole the horse and buggy after he murdered the family, the murders were never solved. But in our teenage imaginations, we solved the murders again and again as we’d sneak out to the old house, decrepit and mold ridden, to scare ourselves and each other to death. Only after the house was burned to the ground by kids more interested in vandalism than ghost stories did the speculation stop. Last weekend as we talked about The Morris Murder house, we also discussed the ghost said to inhabit the upstairs of our old high school and other legends that kept our young minds full of thrills and chills. Few people can resist discussions of things that go bump in the night and for some reason, we crave thoughts that dare us to go beyond what we can control to a world dark and dangerous. For me, that craving was ignited by ghost stories around campfires and radio shows such as The Shadow–“Only the shadow knows.” Yes, thoughts of sinister forces waiting to grab me were terrifying, but there were also titillating. Life became much more than reading, writing, and ‘rithmatic. Around corners danger waited, an early admonition that much was beyond my control and always would be. 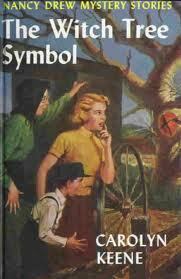 “The Witch Tree Symbol” s one of my all-time favorite Nancy Drew mysteries. It’s about the Pennsylvania Dutch country and hex signs. At the time I read the book, I knew little about the Pennsylvania Dutch but good old Carolyn Keene, who ruled the world as far as little Lyla was concerned, taught me about the power of black magic and personal belief systems. I loved Nancy’s fearless pursuit of bad guys no matter how much she might put herself in peril. More than than, though, I loved her defiance of convention in order to engage in daring do. In Deadly Snooping, the mystery I’m writing now, I want to remain true to the cozy mystery tradition, which is also by the way The Nancy Drew tradition: scare them but don’t horrify them. Last week’s episode of Game of Thrones traumatized and horrified everyone I know. Cozies don’t do that. They present well-plotted stories with intriguing and amusing characters caught in suspenseful, compelling situations. But the unwritten pact between reader and writer says that nothing will be so graphic that anti-anxiety meds may be required. Though the books may keep you on the edge of your seat, you won’t get the chair pulled out from under you. 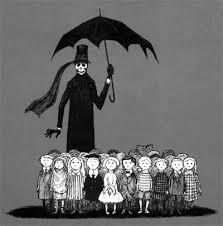 I love Edward Gorey’s illustrations. He illustrated many of John Bellairs kids’ mysteries and his pictures are perfect for the stories Bellairs created. The author had a gentle hand for and uncanny understanding of kids, and though his young heroes and heroines often found themselves in peril, the reader trusted the author to bring them home safe and sound. That’s essentially what J.K. Rowling did with the Harry Potter series. Though the beloved Dumbledore died, he was resurrected for a scene in book seven and the rest of the cherished major players lived to have children of their own. Rowling’s readers hadn’t been let down. She scared them into a delightful frenzy, but hadn’t left them there. 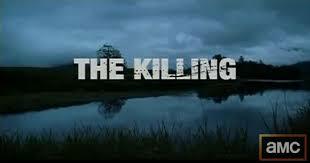 AMC’s Sunday night series The Killing is gory and grisly, and I love it. Set in Washington state, the cinematography artfully keeps the viewers shrouded in a damp, grey haze, perfect for the heinous crimes that have taken place. Yes, I eagerly anticipate the show and hope more people join its growing audience, but I don’t write its kind of mystery. In my office, deep in the bowels of my basement (how’s that for a mystery writer? ), when I pull my chair up to my desk, I want to create a world in which I wouldn’t mind living, a world where people may know death is just around the corner, but they won’t have to see the bodies that are piling up. I think that’s the world I started out in as a child and it’s the world that my classmates, fifty years later, still relished as we talked about the old house we used to root around in. Thank goodness there are writers courageous enough to take on the grimness of the situations depicted in “The Killing.” But as for me, I’ll hang with John Bellairs, Janet Evanovich, David Rosenfelt, and my fellow authors at Cozy Cat Press as we give readers light mysteries to enjoy before they turn out the light to have a peaceful, uninterrupted night’s sleep. Yes, everyone loves a good mystery, but not everyone needs all the bloody details, not me anyway. This entry was posted in Cozy Cat Press and tagged cozy mysteries, david rosenfelt, janet evanovich, mystery, nancy drew, The Killing, the Morris Murder House, writing by Lyla Fox. Bookmark the permalink.